It’s finally time… time for two brand spankin’ new Octodad: Dadliest Catch levels, the ‘Shorts’! After the great response Octodad received from y’all, we wanted to give back a little in thanks for your spectacular support of our fine little game. Everyone who currently owns Octodad: Dadliest Catch and anyone who grabs a copy in the future will get these levels FREE of charge through the new v1.03 patch. It will be available for your PlayStation 4, PC, Mac, Linux on the 14th of October. Next week! After completing the story of Octodad: Dadliest Catch you might have been left wanting for more. Maybe you were curious how Octodad and Scarlet got along after their fateful first meeting aboard the fine vessel ‘The Cod of War’? Perhaps you’re curious what Stacy and Tommy do with their lavish amounts of free time? 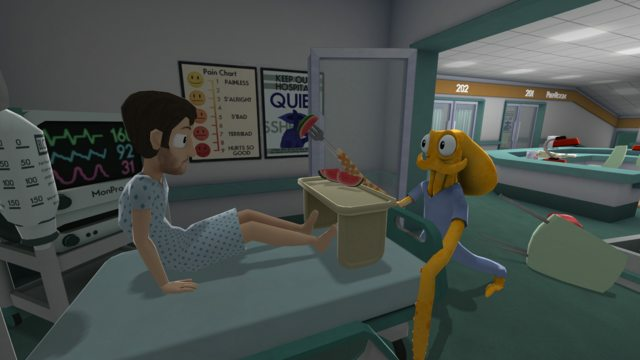 Both of these are things you’ll be able to explore in the Octodad Shorts “Dad Romance” and “Medical Mess”. Remember, even if you don’t have Octodad now you can still get these levels for free along with your purchase of the game in the future. To further celebrate we’re also putting the game on sale for one week (starting 14th October) at 50% off on all platforms. Be sure to pop back here once you’ve played the Shorts and let us know what you think!